It would be nice if Apple offered a Build To Order computer like MacBook Pro WITHOUT the Touch Bar. I know mostly Pro users. None of them wants a “touch bar”, it is a cumbersome gimmick toy that adds additional complexity to something that did not need it. Apple must know the Touch Bar is not popular because they did not mention it at at all at WWDC 2017, and they have not introduced an external keyboard with it. So why are they forcing it onto PRO users with the MacBook Pro? Make Touch Bar a build to order option! Let the pro users have our full keyboards back! Thank you! You could not have said this better! Touch Bar isn’t so much a joke as more evidence that Apple is going down — and fast. THANK YOU, Paul Horowitz, for finally exterminating Siri from my Touch Bar. Mac Sufferers can exterminate Siri under Parental Controls in the guest accounts, if I recall. But only the method described here works for the principal MacBook Pro account — in exterminating the bonking horror pop-up Siri. Do I want to enable it? NO. And I would like to DISABLE it at the moment I am asked if I would like to enable it. 👉🏻Slide slide slide past emojis you 🥀never🥀 use🥀 I get a lot of good feedback to the sign I’ve taped up over the Apple logo: “Ask me how much I regret buying this brand new MacBook Pro.” I like doing my work sometimes square in the middle of Apple Store. I believe I’ve succeeded in discouraging scores of sales of this TERRIBLE FAILURE by Apple Corporation: “MacBook Pro.” Please. What total garbage. I would go crazy if I had that on touch bar on my 2010 MBA. What is the reason for that touch bar? Every time I try a simple function using Serra on the Mac mini 2012, I get a spinning ball, does the top ch bar spin as well? Apple is good though they make incredible computers.justbthe new OS X are deminishing. I think we hit our technology peak in 2011 and everything else developed is a gimmick or promotes social media. I miss my 2013 MBP. It bit the dust. Resetting the SMC used to do the trick. I finally said F’ it and purchased a new MBP with the touch bar. I think I”ve used it a couple of times in the past month. It’s crapl I can’t believe it but Apple for me is losing it’s “I’m cool becauase I’m on a MAC” appeal, and just the fact that they make better machines and have siince getting my first MAC in 1990. Oh well, I’m getting old so I’ll just retire with the good times in my mind and maybe try and have a less computer intense life. Time for Travel, Music, Diving and maybe sleeping. Kayaking with Manatee’s and my Bulldog and good music is getting better than spending time on products that Tim Co0k has made a mess of . He should go be a side kick for his buddy Rush Limbaugh, and put the British Jonathon Ive in charge. He’s the man! Wow, i’m tired and sick of Apple making lame stuff.I do have a 2010 MBP and it’s better than this 2017 i7, 13″ MBP. This thing is a pain in the arse. OH, Tim Cook, just wanted to say since you’ve basically given up on nice hardware and quality software as you focus on phones and Emoji’s you’ve crushed Apple. I can’t believe I have t ist through WWDC just to hear you announce how excited “we” are about the new Emoji’s. Who are you talking about???? Here’s they one I use :-P Later. so I tried this bec. Siri button drives me nuts. But, when I get to the customize keyboard screen there is no trashcan visible so I am unable to drag Siri to the trash can. 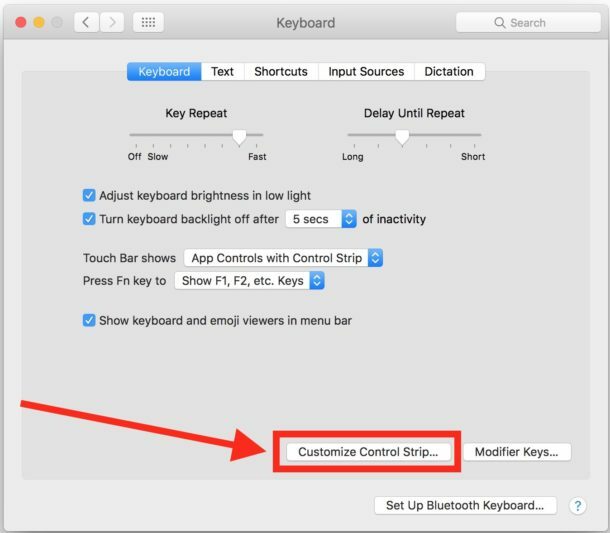 Move your cursor past the bottom of the screen and it will activate the touch bar. Select siri and move it to the trashcan all the way to the left of the touchbar. Thanks, Mike. Did not get that at all from the article instructions. placing siri next to the delete button is borderline satanic. apple obviously wants their customers to have mental breakdowns. sad they’re so bored – instead of advancing anything they just cause problems. like doggles. miss the jobs days. thank you for helping. As previous commenter said, putting siri right above the delete button is just plain evil. so intentional. so grateful for the option given here to remove it. it drove me nuts for 18 months. the only other thing i use the touch bar for is volume control. anyway, thanks for the solution.